Today's artist of the week is D. Alexander Gregory, an artist who has been doing MTG art since 1996. His first art to appear on a Magic card was Sworn Defender in Alliances. Art for some of this cards have even shown up in FTV sets such as Jester's Cap and Gift's Ungiven (originally from 9th Edition and Champions of Kamigawa, respectively), but even the original art for Nicol Bolas for From the Vault: Dragons. Of all his art, there have only been two lands: a Mountain (originally printed in Time Spiral and reprinted in Planechase 2012 and again in DD: Heroes vs. Monsters) and Maze of Shadows (printed in Tempest). Of course, D. Alexander Gregory is probably best known for his planeswalker art featured in the six planeswalkers of M13. His only art currently on Standard-legal cards are Ajani, Caller of the Pride, Jace, Memory Adept, and Liliana of the Dark Realms, all of which were reprinted in M14. 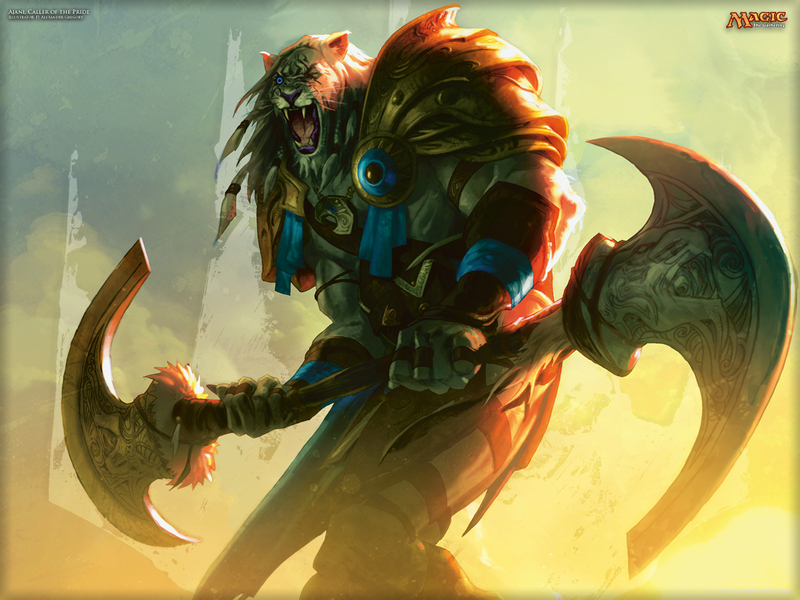 Click the above image in order to download various sized wallpapers of Ajani, Caller of the Pride. By clicking the following links, you can also find wallpapers for Jace, Memory Adept, Liliana of the Dark Realms, and Nicol Bolas, Planeswalker. You can find D. Alexander Gregory on his website.